During the Custom Bike Show fair in Bad Salzuflen, Germany, Metzeler has unveiled the new Cruisetec, the Custom Touring tire designed to optimize the performance of modern and past V-Twins and intended for motorcyclists who want to get the most out of their motorcycles in terms of handling and grip. With the new Cruisetec, Metzeler extends its successful V-Twin range towards performance-oriented use. This tire upgrades the handling of current and older motorcycles, featuring remarkable grip even in wet conditions, ground-breaking performance consistency and innovative stability features. Cruisetec features ground-breaking specifications for tread pattern, compound recipe and carcass specifications in the production of tires for V-Twin motorcycles. Metzeler has developed Cruisetec to respond to the needs of motorcyclists who increasingly look for emotional, carefree riding and live their riding passion on V-Twin machines they can customize with performance in mind. Cruisetec has been designed to couple with the latest generation of cruisers and tourers, machines that the relevant manufacturers in the segment are equipping with high-rated performance parts and the latest electronic rider aids. 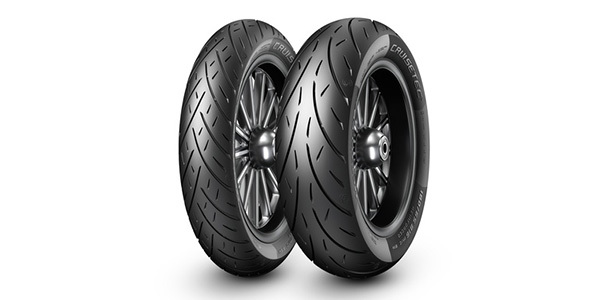 With the Metzeler Cruisetec tire, these motorcycles can express their full potential for agility, increased lean angles, improved stability, comfort, shorter stopping distance and faster cornering.